Elk County was created on April 18, 1843, from parts of Clearfield County, Jefferson County and McKean County. The county was named for the herd of elk that once roamed there. Some historians believe the reference may have been to the Elk Creek. The county seat of Ridgway was named for a local landowner, Jacob Ridgway. The borough was laid out in 1833 and incorporated on February 15, 1881. Looking to further your research in Elk Co.? Try these book titles below. We are currently researching available titles relevant to this county. For general information and books about Pennsylvania, or to locate information about other counties, visit the Pennsylvania Page of Time Voyagers Bookstore Don't forget to check on the parent county from which a county was originally founded. A brief history of this county will appear here soon. 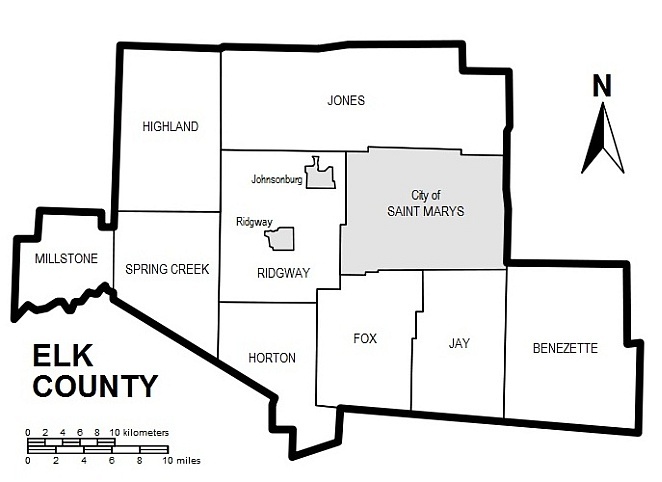 Map of Elk County, Pennsylvania, United States with township and municipal boundaries is taken from US Census website and modified by Ruhrfisch in April 2006. We are currently researching useful Web links relevant to this county. Check out the entireTIME VOYAGERS BOOKSTORE for general titles in genealogy, history, or general best sellers.